The Academy of Motion Picture Arts and Sciences announced on 7 December 2017 that Unrest, produced by Shella Films and Little By Little Films, is one of 15 films in the Documentary Feature category that will advance in the voting process for the 90th Academy Awards®. 170 films were originally submitted in the category. Unrest was directed by Jennifer Brea, and produced by Jennifer Brea, Lindsey Dryden, Patricia E. Gillespie and Alysa Nahmias. Deborah Hoffmann was Executive Producer and Creative Advisor. 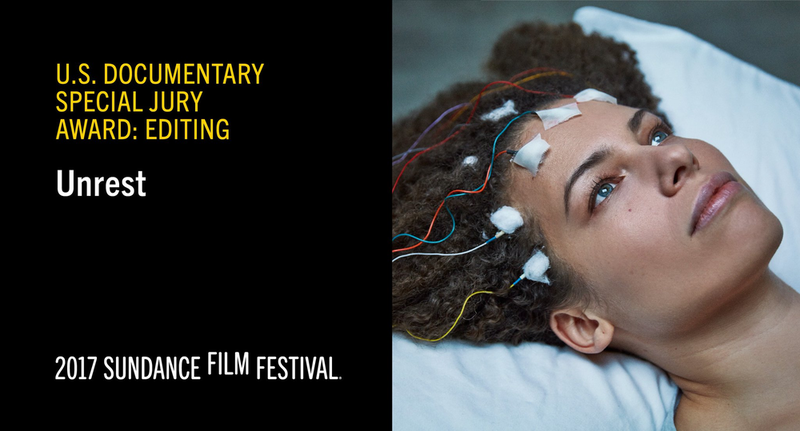 Unrest, the feature documentary about ME (also known as chronic fatigue syndrome) which premiered at this year’s Sundance Film Festival and won a Special Jury Prize for Editing, will get a UK release in October. Unrest will be independently released by its producers, Jennifer Brea’s Shella Films based in Los Angeles, and Lindsey Dryden’s Little By Little Films based in Gloucestershire, UK, in collaboration with indie distributor Together Films. The Cinema and Television Benevolent Fund (CTBF), the charity for moving image professionals, has today announced the Summer 2017 winners of the John Brabourne Awards. Twelve Awardees, including Writer/Director/Producer Lindsey Dryden, Writer Nell Garfath-Cox and Actor/Producer Xenia Glen, have been chosen from a pool of 157 by an industry panel to each receive up to £5000 in order to progress their careers. Scottish poet laureate Jackie Kay celebrates queer British art with emotive story about finding her identity for Tate Britain and Channel 4's Random Acts film collaboration. Directed by Lindsey Dryden, the 55-year-old writer describes how the character in the story is on the run from herself, which later forced her to question what identity meant to her as a black, Scottish woman growing up. Sheffield Doc/Fest announces its award winners for 2017, including the Illuminate Award for Unrest (directed by Jennifer Brea, produced by Jennifer Brea, Lindsey Dryden, Patricia E. Gillespie, Alysa Nahmias) and the VR Award for Unrest VR, co-created by Jennifer Brea and Amaury La Burthes and produced by Jennifer Brea, Arnaud Colinart, Lindsey Dryden, Amaury La Burthes and Gregoire Parain. Hosted for the first time by BBC Radio Sheffield presenter and Doc/Fest fan, Paulette Edwards, the Sheffield Doc/Fest award winners each received a bespoke Sheffield steel trophy, The Steel Core, created for Sheffield Doc/Fest by Sheffield artist Harrison Moore. 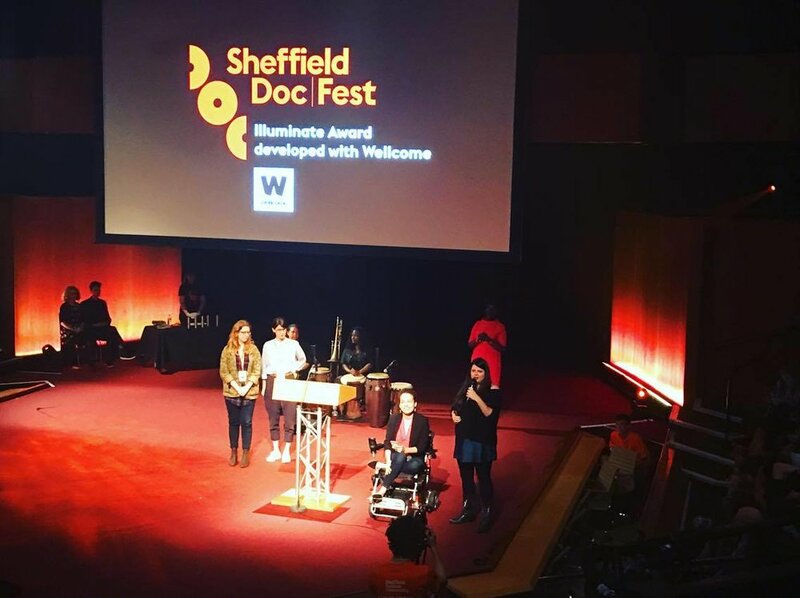 Unrest, a project produced by former WFTV mentee Lindsey Dryden has picked up two awards at Sheffield Doc/Fest. The film won the Illuminate Award, which is supported by the Wellcome Trust and celebrates vibrant and innovative filmmaking inspired by scientific understanding. And the accompanying VR project for the film has won the Alternate Realities VR Award at the festival, which is awarded to the best virtual reality project. Queer Voices On and Off Screen, March 13, 2017. Join indie documentary and narrative filmmakers Jessica Devaney, Lindsey Dryden, Ingrid Jungermann and Sam Tabet as they grapple with the stories their films should tell, and explore the ways that filmmakers can ensure LGBTQ perspectives are reflected both in front of and behind the camera. The film chronicles director Jennifer Brea's battle with Chronic Fatigue Syndrome, and the PBS network has acquired U.S. broadcast rights for its Emmy Award-winning series Independent Lens. The series will broadcast the film during the first quarter of 2018, following an international theatrical release. Brea produced the doc along with Lindsey Dryden and Patricia E. Gillespie. Deborah Hoffmann, Ruth Ann Harnisch, Regina K. Scully, Lisa Gunn, Donna Fairman Wilson, Dan Cogan, Ian Darling and Lynda Weinman executive produced. A Sundance Film Festival that was colored, gripped and sometimes overshadowed by the early days of the Donald Trump administration saw a slew of feminist films win big at the gathering's awards. Multiple female filmmakers nabbed top prizes, while a tale of a woman reasserting control over her life scored the festival's highest honor. Unrest won the Special Jury Award for Editing: Kim Roberts and Emiliano Battista. This year’s participants work in fiction and documentary, adult and children’s TV, theatre, commercials, learning disability film exhibition, and immersive cinema experiences. Guiding Lights is run by Lighthouse and supported by Creative Skillset’s Film Skills Fund, which is funded by the BFI with National Lottery funds, through the Skills Investment Fund (SIF). 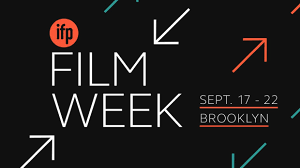 IFP, Filmmaker‘s parent organization, announced the 120 feature film projects that will take place in its annual IFP Film Week, taking place September 17 – 22 in DUMBO, Brooklyn. Particularly noteworthy this year are the roster’s gender diversity states: 40% of the narrative directors and 60 % of the documentary directors are women. Billy (written and directed by Lindsey Dryden and produced by Lindsey Dryden, John MacFarlane, Sarah Spring, and Selin Murat) is a queer music mystery, and a creative documentary about one of the 20th century's most intriguing LGBTQ icons (in development). The Sheffield Doc/Fest is one of the world’s premiere non-fiction film festivals, celebrating both the art and business of documentary film. The business part is a key component, as Sheffield’s MeetMarket has unlocked over $53 million of deals for documentarians since its inception in 2006. It’s for this reason that the filmmakers at Sheffield, while in addition to being top-of-their-field artists, are also experts at how to pitch their projects and getting investors onboard. 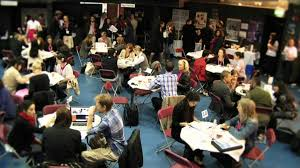 To tap into some of that knowledge, IndieWire reached out to six of these experienced filmmakers who have had success pitching and are participating in this year’s MeetMarket, including filmmakers Lindsey Dryden and Al Morrow, to get their advice about what does and does not work when presenting your project to investors. 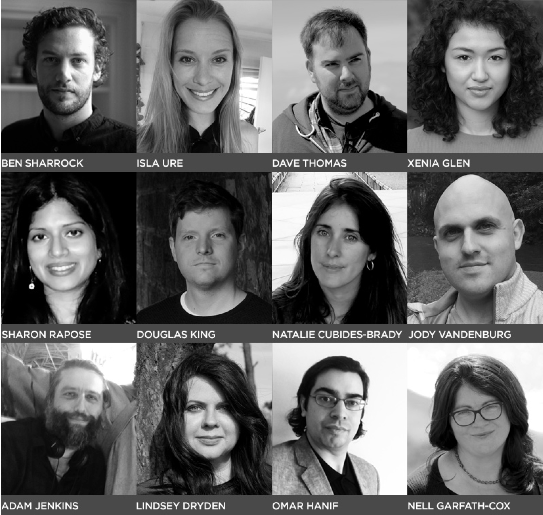 Selected from more than 200 international submissions, 19 selected projects will be presented to a round table of leading commissioning editors, film fund representatives, financiers, programming executives and delegates during the mornings of May 3 and May 4. Projects come from 16 countries, and are helmed by 11 female directors and 26 female producers. The selection includes Billy, directed by Lindsey Dryden, produced by Parabola Films (Canada) and Little By Little Films (UK). Our ‘Filmonomics Filmmaker Profile’ series spotlights each of our 2015 Filmonomics participants, giving you an insight into their projects and working practice. This week, we chat to Lindsey Dryden about equal representation on film, the importance of saving up to make movies, and seeing the films you believe in. Jen Brea, Lindsey Dryden and Trish Gillespie from Canary – a documentary film about ME/CFS – were one of seven film teams to present at Good Pitch New York, a gathering of foundations, NGOs, campaigners, philanthropists, policymakers, brands, technology, government, and media to forge campaigns around films addressing leading social issues. The Future Producer School programme, created by Sheffield Doc/Fest and Bungalow Town Productions, has selected its inaugural Fellows, including Julia Nottingham, Lindsey Dryden, John Stack and Anna Griffin. Underwire Film Festival has nominated Lindsey Dryden, producer of director Joanna Coates' short documentary 'Little Ones', for the Best Producer Award supported by Women in Film & Television UK. If you only had a few minutes before you lost your hearing, what three songs would you listen to? British director Lindsey Dryden poses this question, asking people for their 'Panic List'. The prompt works conceptually as a prequel to Dryden's first feature film, in which it becomes a catch-22 -- what would you listen to after you lost your hearing? 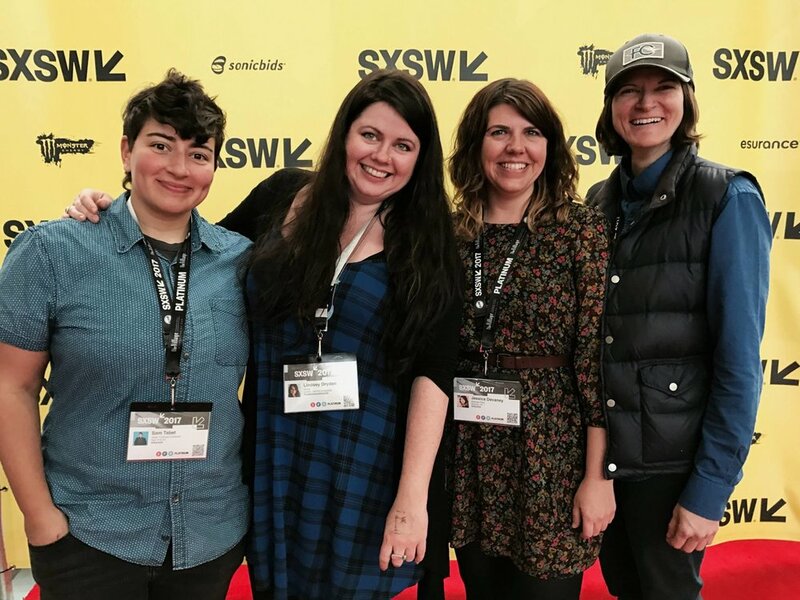 Dryden, a director and '"music obsessive" who is partially deaf and was facing further hearing loss when she began making the film, explores the lives of three subjects with hearing loss in her documentary, "Lost and Sound," which premiered at SXSW earlier this month. For each, music is such an inextricable part of their lives, they found a way back in -- or into it for the first time -- after losing their hearing. Reactions to the film post-screening were warm, the audience sharing in something intimate and unexplainable about the human spirit. Lindsey Dryden’s feature documentary Lost and Sound has blazed a trail across the world since its premiere at the prestigious SXSW festival in America in March this year. The film is about deafness, the brain, and music, featuring three deaf people and their journey into sound. Lindsey is herself deaf, so we asked her about her life and her work, in roughly that order. 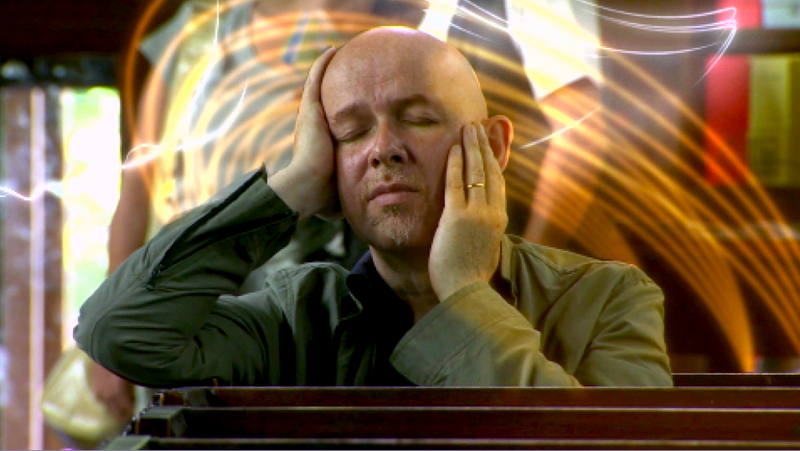 Lindsey Dryden's documentary Lost and Sound looks into the lives of three people – a dancer who's been deaf since birth, a young pianist who lost her hearing as a baby, and a middle-aged music critic who's gone totally deaf in one ear. These personal threads of narrative, shot as naturally as home movies, are interwoven with graphically enhanced commentary from audiologists and academics – and with beautiful, polychrome clouds-in-water sequences that attempt to replicate, visually, the often fluid and billowing architecture of music. Director Dryden is hearing-impaired, note, but neither deaf nor blind to what it takes to construct a fascinating documentary film.